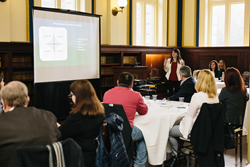 Application development, systems integrator Trilix helps workshop attendees carve the path to workplace excellence. Trilix Principal of Marketing Carrie Majewski leading attendees through a portion of the Workplace Excellence Workshop. With 75 percent of American workers feeling they do not have access to the latest efficiency-boosting technology—and 49 percent feeling actively disengaged—a top concern of all business leaders is how can we do better? Since its inception, Trilix has partnered with business leaders to examine more closely the daily technology, process and system impediments that negatively impact the workplace. When these issues are brought to the foreground, prioritized and addressed, businesses take critical steps forward in re-engaging and re-energizing their workforce. To help business leaders tackle process, system and technology woes more intentionally, Trilix is introducing an interactive workshop, “Build Your Path to Workplace Excellence.” The two-hour deep dive gives attendees the chance to identify the top obstacle that is prohibiting them from reaching desired goals, apply Trilix’s Workplace Excellence Matrix as a framework to start prioritizing a path to greater impact, and gain understanding in how to better fuse together operations and cultural elements. The workshop is ideal for peer leadership teams or department leaders who wish to take their teams through this experiential workshop. The session will be led by members of Trilix’s executive leadership team and will be performed on-site at the attendees’ facility. Since Trilix opened its doors in May of 2017, it has sparked important dialogue on how to better align workplace operations and culture to achieve organizational goals. In addition to launching a monthly blog series profiling leaders who subscribe to a workplace excellence mentality, Trilix has also held a series of events. On June 12, Trilix will bring community leaders together for a Workplace Excellence Summer Meet-Up. To learn more about Trilix’s new workshop offering, click here. Trilix, a New England-based company, empowers clients to reach a heightened level of workplace excellence. Trilix offers differentiated services across: business process and workflow analysis, application development, systems integration, user adoption, and consulting and advisory services. Made up of a team of senior-level developers, innovators and trailblazers, Trilix helps clients realize their full operational potential. From SMBs to Fortune 500 companies, Trilix has helped businesses across numerous verticals build the bridge to their desired future state. To learn more, please visit trilixtech.com. Find Trilix on our Blog, Facebook, LinkedIn and Twitter.